Everyone feels a bond towards their local bands. There's more of a bond felt with bands from your city, and even more so when they go to the school in your grandmother's backyard. However, Hotspur shows they have an exceptional amount of talent. From playing charity shows at a local high school, to headlining shows at the 9:30 Club, Hotspur's unique style has won over the entire area. 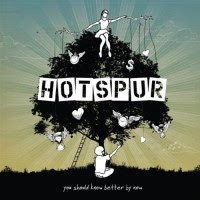 One track into the album, you can see how Hotspur is different than other bands. The unique vocals, witty lyrics, and extreme passion in the vocals are strengths. You can hear the paranoid feelings in the final verse of "Hypochondria" as they sing "Everybody's following me." The lyrical strength first shows up in the entirely metaphorical first verse of "Chandelier." Hotspur also shows they can take things down a notch on "Too Young" by creating a song meant to wave open cell phones while giving off a message that every young person should understand. "$$$" may have some of the most cliche lyrics on the album, but it is also one of the catchiest. Soon, you hear the soft piano strikes of "Heads/tails." This song is a masterpiece. The lyrics of the chorus are absolutely brilliant. The song keeps a catchy drum beat while still having the emotional support of the piano. The piano bridge leading to the electric final chorus and the final piano fade out may be best moment on the album. "Heads/tails" is the new single off the album, and with the right promotions, this song could be a top 40 hit. Hotspur continues the strong middle of the album with "Gunfight." The beginning of the song is a little too repetitive, however the chorus is the best flowing and one of the catchiest on the album. "Sold!" is a fun, upbeat song that will make you just want to dance. "Alphabetic File" is another lyrical strong point which showcases more vocal range than any other song. "You Should Know Better By Now" is a perfect upbeat album closer that will leave a listener dashing to press the album repeat button. I definitely did. Hotspur is on the brink of bursting out huge. Their first video got plenty of MTV airplay, and their second video is sure to exceed it in airplay. They put a hell of a show that everyone should see. Anyone from a 12 year old girl to her grandmother can like parts of this album. Montgomery County, Maryland will soon have its biggest band since O.A.R. Check out Hotspur on myspace HERE.